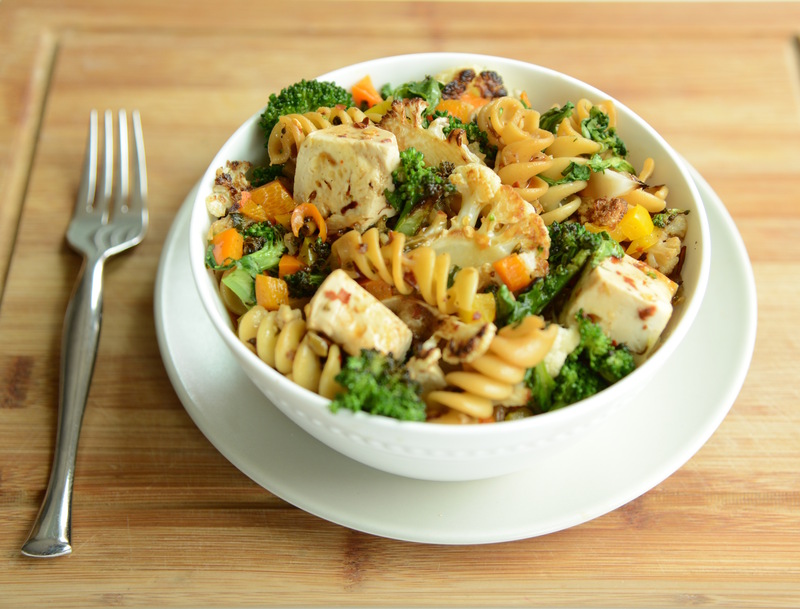 Vegetables, pasta and marinated tofu. 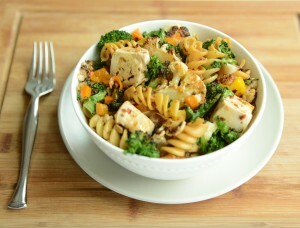 This simple but addictive tofu and pasta dish is happily adaptable to any vegetable. The secret is in the sauce: a quick mixture of soy sauce, white wine vinegar, garlic, and ginger. If you’re not a fan of tofu, you might change your mind after you taste marinated and roasted tofu. Place each block of tofu on a paper towel, place another paper towel on top, and cover with dinner plates for at least 30 minutes to gently remove excess liquid. To prepare the sauce, whisk together the sauce ingredients in a glass container and set aside. Remove the tofu from the sauce and spread onto a parchment-lined baking sheet (retain the sauce; it’s used later). Roast until the tofu is brown around the edges, about 20 minutes, turning the tofu midway through cooking. On another parchment-lined baking sheet, spread the cauliflower in a single layer. Drizzle with 2 tsp grapeseed oil. Roast until brown around the edges, about 20 minutes, turning the cauliflower midway through cooking. Heat 2 Tbsp grapeseed oil in a large skillet and cook the onion over medium heat until well browned. Add the kale, using tongs to toss and coat the kale in oil. Cook until the mixture has reduced significantly and no liquid remains. Add 2 cloves sliced garlic, cook until aromatic, about 30 seconds, then add the peppers. Cook until the peppers are slightly cooked, about 3-5 minutes. Transfer to a bowl and set aside. In the same skillet in which the kale mixture was cooked, heat 1 Tbsp grapeseed oil and add the broccoli, tossing occasionally, until lightly cooked but still firm. Reduce the heat and return kale and pepper mixture; add the cooked pasta, roasted cauliflower and tofu and about 1/2 cup sauce. Toss to combine, being mindful not to break the tofu. Heat through, adding more sauce as needed. Serve into heated bowls, and sprinkle with red pepper flakes, if desired.